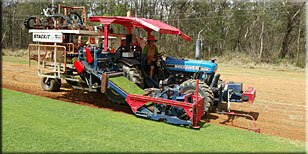 Turf is sold based on how many square meters you require. To calculate how many square meters you need, simply measure the area you need turfed in meters. Multiply the length of the area by the width. If you have multiple areas, do this for each area and then add the results. We have a Turf Calculator that you can use to help you perform these calculations, please visit THIS PAGE.